Space per pupil: 110 sq.ft. 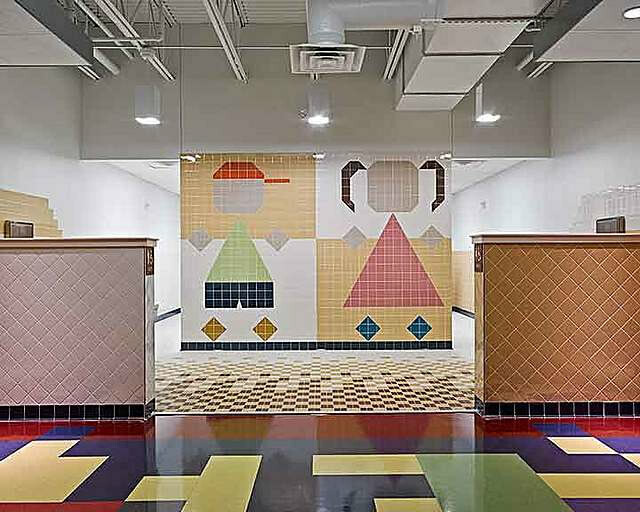 Situated on a tight site, this playful facility unites a cost effective design with well-balanced visual aesthetics. 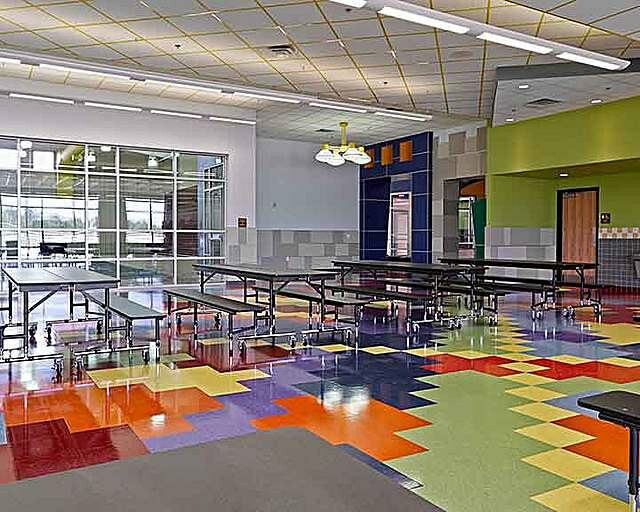 The school includes: thirty-two age appropriate classrooms, two computer labs, media center, full-service kitchen and a cafeteria with a multi-purpose center, including a stage. The teachers benefit from central resource centers/workrooms which include a refrigerator, microwave, sink and ample cabinet space along the walls and under the workspace island. Restrooms are appropriately located in each of the classroom wings to provide easy access for children and staff. Teachers and staff alike were exceedingly surprised with the amount of storage space made available for them to utilize throughout the building. In keeping with the district’s need for expansion, the school was designed with additional space on the site for future growth. Currently, 480 students are enrolled, but the new school allows for 600 students. 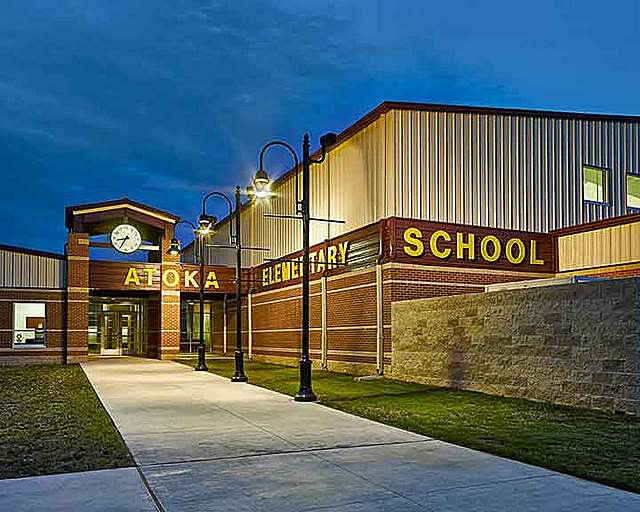 The goals for Atoka Elementary were simple: the kids come first when making each decision, functionality and cost effectiveness. Everyone involved focused on creating a fun and inviting place for kids while encouraging learning. 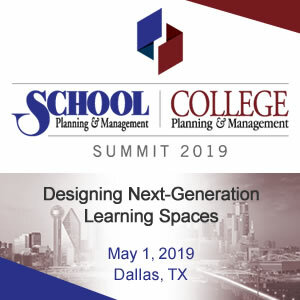 Previously, the elementary school was located at a different site, but this space-saving design allowed for the new school to be built on the same campus as the middle school and high school. There are three drop-off/pick-up loops; one bus loop and two areas specifically for cars, which allows for a more cohesive flow. Designed and built for the kids, secured entrances separate the classrooms from the multi-purpose center and cafeteria which are both open and available for community use. 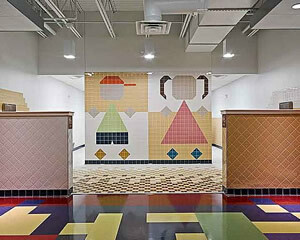 The imaginative classrooms and bright color schemes provide a jovial and functional facility. Each classroom is equipped with state-of-the-art media equipment, featuring smart boards that are wired to a central media hub while the 3-D design aspects throughout the building encourage creative thinking. Each classroom houses a lower lighting system which sets the light at a level that is least distractible and most ample for learning. 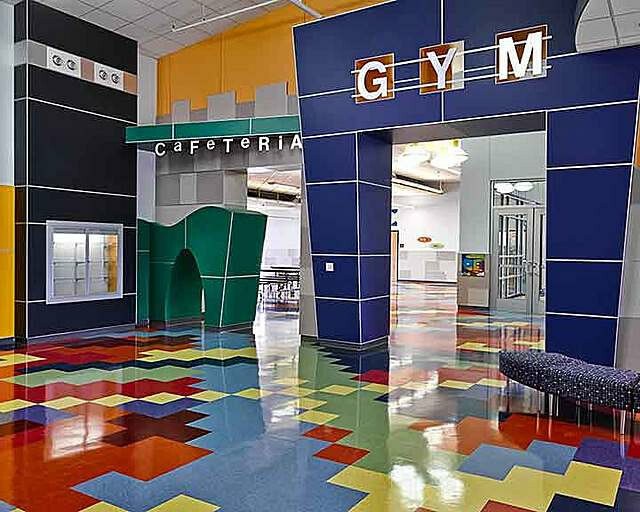 The activity center includes a 3-D entrance with a “mouse door” for kids to walk through predicting the care-free lunch and recess time awaiting them. Students must walk into the “Little Red School House” when entering the academic area symbolizing a quiet and studious environment. “These small details appeal to the kids and encourage energy and creative thinking” says Principal Kathy Perkins who loves making her way through the “mouse door” to spark laughter from the students. Teachers appreciate the separation each grade has from one another because it provides for a quiet and focused learning environment. With the new building came adequate storage space in each room for both teachers and students. Lockers and water fountains are housed in each classroom which allows more time to be put back in to academics. Students, parents and staff alike enjoy the new activity center that is equipped with a multi-purpose room for plays, games and evening meetings. Without this space activities would be housed in the middle school or high school gymnasiums. The oversized library/media center includes separate reading and computer areas for the students which allow for quieter space, when needed. The library contains kid-size windows to provide a brief distraction during the school day. The safety and security of the children played a vital role in the design on this school. To start off, there is a secure two-door entrance in which visitors must enter the administration office prior to gaining access to the academic area. 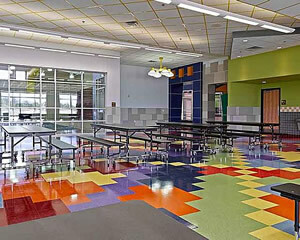 The cafeteria and gymnasium are separate from the classroom area which allows that space to be available for community activities. The open floor plan and wide hallways permits easy exit from the building during an emergency. Furthermore, the administration and academic areas can be closed off and locked down which provides an extra sense of security to parents, staff and children. In addition to the secure layout, the restrooms play a large role in the safety of the students. It has been shown that bullying in school often happens in the restroom, specifically while children are washing their hands. With this in mind, the bathrooms were designed so that the sinks are close to the restroom exits. The exits are open, visible and within earshot to the teachers to maintain the well-being of the students. 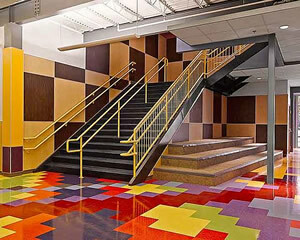 Durability and stress-free maintenance were key when selecting the material for the school. Plastic laminate wall panels were used to provide resilience, minimal upkeep and simple replacement, if necessary. The flooring aids in providing a quiet atmosphere and creates an easy to clean high traffic area. 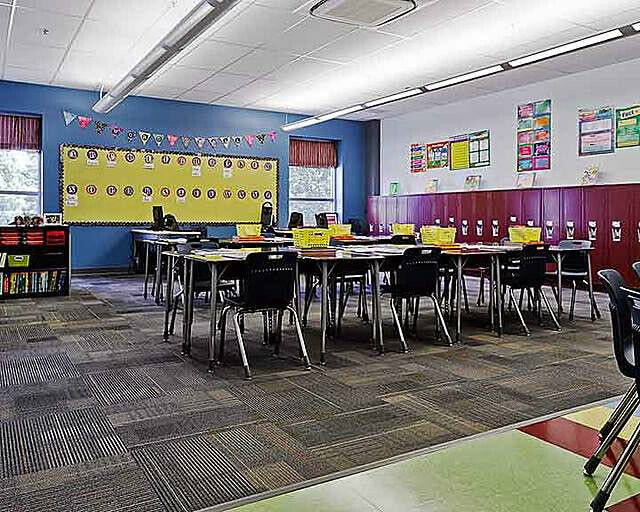 Classrooms are equipped with both carpet and tile flooring. The teachers appreciate the option to do messy projects on the tile floor for easy clean up. The HVAC design included five Variable-Refrigerant-Flow (VRF) systems that have a total of 74 tons of capacity. Benefits of this HVAC design include: highly energy efficient, ductless terminal units which reduces the work and cost, no water piping above ceilings, very low maintenance, easily accessible, lower electrical use and a very quiet operating system.